Going on a road trip with your dog is definitely an awesome and unforgettable memory. Gretel and I just finished up a nine-day, almost 4,000 mile road trip with some friends. We had a lot of adventures and made a lot of memories. Some of the adventure was unplanned, but because we were prepared, we felt like there wasn’t anything we couldn’t handle. Just like humans, some dogs have tummy issues due to the motion of the car. Signs your dog may be car sick include constantly licking their lips, excessive drooling, constant yawning and panting, nonstop whining or crying out in distress and vomiting or regurgitation. If your dog is exhibiting any of these signs, don’t lose hope. There are some things you can do to minimize your dog’s motion sickness. With a little help, they may start to feel more comfortable riding in the car. When traveling, your pup’s normal feeding routine can be disrupted. Have a plan in place a few days before you leave. Plan your stops around your dog’s normal feeding times to help maintain as regular of a schedule as you can. Although minimizing your dog’s water intake can help prevent accidents in the car on short trips, when you will be traveling for days you don’t want them to get dehydrated. Instead, make sure to always have water available and plan for plenty of potty breaks. Also, right before you leave is not the time to switch your dog’s food or treats. Traveling can be tummy-disrupting so stick with what they are used to until they get back. It’s easy to get in the zone while driving and forget to take breaks. 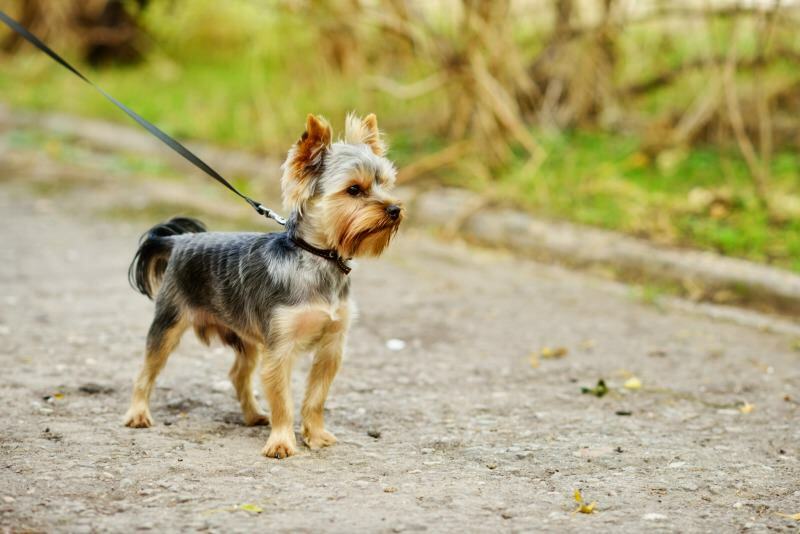 That’s especially true if you’re really excited to get somewhere or you are in a hurry, but not taking regular breaks is bad for your dog and you. Both of you can get stiff and develop cramps from being in one position too long. Also, having your dog “hold it in” for long periods can lead to a urinary tract infection or worse. I help remind myself to stop, and make it fun, by playing the 100-mile road trip game. You put a seatbelt on. Your furry family member should put one on, too. A dog roaming freely around the car can be a distraction and it’s possible they could startle you by trying to jump into your lap. Keep them in their own seat with a safety tether, put them in a doggy car seat, or confine them to a kennel if you can. Remember though restraining them is only the first level of safety. Most “dog safety” products on the market have not been tested for performance in a crash test. The “safety” comes from reducing the chance you’ll get in a car wreck in the first place. If you want to give them a better chance of escaping a crash uninjured, check out this list of products that have been crash tested by The Center for Pet Safety, and are considered “top performers.” Using a crash-tested restraint system is the best chance you have of keeping your pup safe in a crash. Realistically though, once you get all of your gear in the car, you may not have room for a car seat or crate. While I don’t advise leaving your dog loose in the car, if you must, at least give them a designated and comfortable spot to lay. An uncomfortable dog is more likely to be a distraction to the driver. Taking a road trip with your dog can be very exciting. Exciting and pleasant are two different things though (exciting doesn’t always mean positive). 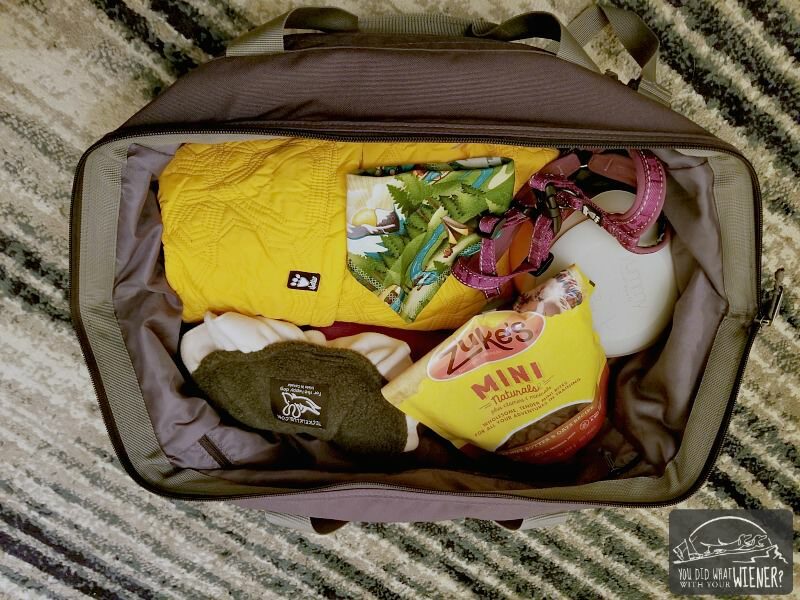 To make your road trip easier and more comfortable, consider bringing these things: a car seat cover to protect your seats from wear, extra towels to clean off your dog before they get in the car, a pet first aid kit to help handle life’s little emergencies, and a travel water dish to keep your pet hydrated on the go. 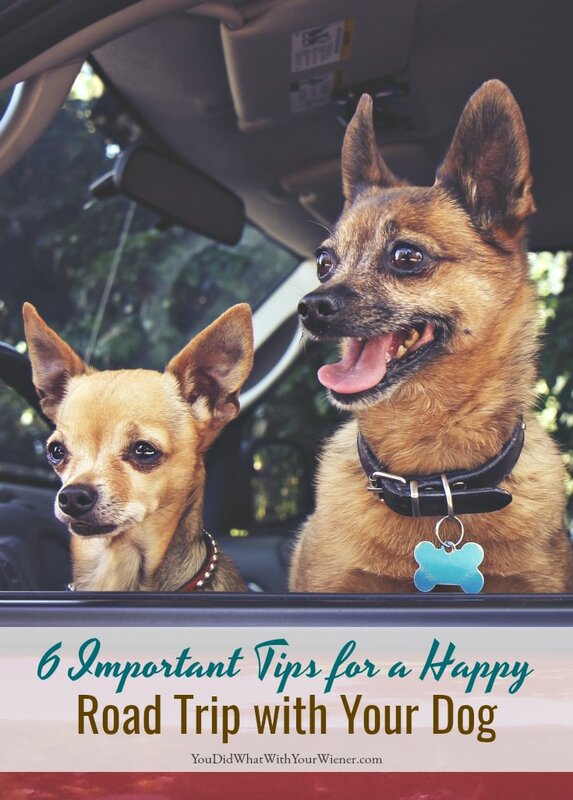 Check out my full list of must-have essentials for a safe and happy road trip with your dog. Some dogs like to sleep a lot in the car and only periodically wake up looking for something to do. Others are busy-bodies during the entire drive. A bored dog will find his or her own way to busy themselves and they may not do it in a way that pleases you. To avoid any unwanted behavior, bring something like a food puzzle or treat toy that will keep them busy while they are awake. After you’ve taken a few road trips with your dog – and I suggest you do because it’s a lot of fun! – you’ll find what works best for you and settle into a routine. Your dog will likely even grow to love it. When I take Chester and Gretel out for a walk, we always pass our car. Every time, they pull toward it like they’re excited to go. These are great tips. I wish my niece’s dog liked the car so we could take him with us when we go out to certain places. He always looks so sad when we leave him alone! Meowza! That’s a loooong trip in the noisy metal machine! We felines are not so excited about road trips but purrhaps if our humans tried some of these tips we’d like traveling better. Aww… come on now. I see cats riding in cars and RVs all the time on Facebook 🙂 I know what you mean though. All of my cats have hated the car. I never tried to get them used to it though. Most of these I follow when taking my dog Victor on trips for dogtrotting.net. He sits in the back seat nicely and I have no problems with him moving around. I do have to remember to stop the car more frequently. Several things I have learned: take more towels and wipes, research leash-free parks near the hotel, and ask if possible to be on the bottom floor so early morning pee breaks are easier. ALL THE TOWELS! Ha, ha. Chester and Gretel have more towels than I do 🙂 Luckily, I’ve found that almost all hotels put you on the bottom floor if they know you have a pet. It’s better to ask than be unpleasantly surprised though. Mr. N hasn’t been on a super long trip yet. I think six hours (back and forth to Seattle) has been the longest. If we have a longer trip, we’ve gone by plane. Mr. N rides in the crash-tested Pupsaver car seat. 6 hours is still a pretty long day. When we are on the road, the longest days we do are about 12 hours (of actual driving). Regular, sufficient breaks are indeed crucial. Not just for potty breaks, but for stretching out, destressing … Our guys have already been extremely good on trips but I think they’d be pretty miserable without enough little breaks. Gretel sleeps most of the time so she has no idea how long we’ve been driving. Ha, ha. I sure do though. The breaks are almost more for stretching and destressing ME. We are so lucky! Rooney actually loves the car and road trips! He commutes with me to work at least once a week, so he is very used to the car. Additionally, on long road trips, he just settles in for the ride. However, we find that he stays calmer longer in a crate in the car (with a comfy bed of course), rather than in a seat with his seatbelt. Gretel is a time-traveler too 🙂 She’s out about 30 seconds after the car starts moving. Ha, ha. Glad you found what works to keep Rooney more comfortable. I think a crate can help them not jostle around so much. These are very helpful tips. I’ve traveled with pets who do and don’t like car trips in the past. One thing to remember is that motion sickness can be more likely and more severe if you put your dog back into the car immediately after eating. Try to give your pets at least 15-20 minutes to relax before hitting the road again so their stomach has time to settle. Yes, good point I actually wrote an article about dog carsickness and do mention that. I just didn’t want to write a novel here. Ha, ha. Great tips. As soon as we have the continuous licking sound we find a spot to stop for a stretc, fresh air and water break. Thankfully, we’ve only haa few pukey situations. At least you get a warning sign. Ha, ha. We now add a treat that calms … because someone is getting car sick more frequently. Need to find a good solution for him being up front … still looking. Stay tuned! These are great tips. Seat belts are so important, and not all are created equal. Making sure the ones you use are crash-tested is very important! Sounds like you & Gretel had quite an adventure – 9 days & 4,000 miles, that’s impressive! These are great tips for long road trips with dogs. Fortunately, both my dogs love road tripping with us and they do sleep much of the time in the car. However, it would be good to have a simple busy toy for my Husky Icy, she doesn’t sleep as much as Phoebe on the road. I think I’ll try that next time, thanks! I LOVE road trips. I don’t mind driving at all. I did have driving help on this trip though. Wow, I’m impressed with you traveling 4000 miles in 9 days. We usually only travel 200 miles in a day. What did you see along the way? Gusto does not like to drink when we travel. He keeps a treat with him in his kennel but won’t eat it until we get to our destination…lol. Continue to have safe travels! Gretel won’t eat when she’s stressed. Not even her favorite treat. That usually only happens when we fly though. She often doesn’t drink enough water outside of the house though, no matter what we are doing. She has me trained to put some coconut water in her bowl. She loves that and will drink. The things we do! Ha, ha. Our trip was to Arizona and back from Seattle. As you can imagine, it was a pretty short trip. We still saw a lot of stuff though. We stopped at the Bonneville Salt Flats, Coral Pink Sand Dunes, Bryce Canyon, Wire Pass Canyon/Buckskin Gulch, Horseshoe Bend, Waterhole Canyon, Peralta (sp?) Canyon, and Dutchman Gap State Park. Plus we drove several backroads. Your strategy for reminding yourself to take frequent breaks is much more fun than mine. I set an alarm. And just so I can’t ignore it, I usually set the ring tone to something obnoxious like that one that sounds like someone has initiated the self-destruct protocol on the spaceship. I’m going to have to try the 100 mile road trip game on the next road trip. The alarm trick sounds good too. I CAN ignore the speedometer or forget to check. These tips seem so obvious BUT for someone like me they are a timely reminder of do’s and don’ts for a travelling animal. When we took our Dusty cat on road trips (he was the ONLY cat who loved LOVED the car!!!) we were like your list – we need this, we should take that and finally did we forget anything. These needs to be pinned to every dog owners fridge it is SO useful! How fun that Dusty liked the car. That can be rare with cats. That’s a very good point. Here in the Northwest we have a lot of grass. Gretel is less pleased when I make her go potty right on dirt or rocks. The first time it took her a while to realize it’s ok. Luckily, Chester and Gretel are pretty trained to go potty on demand. I just kept saying the magic word and eventually she went. It sounds like you had a great trip. I think the key to having an enjoyable vacation with dogs or kids is to set realistic expectations and have some unscheduled time. I’ve found that being organized really helps, but just as important is being flexible when something doesn’t go the way I had planned. Yes, flexibility is key. I knew what day/time we were leaving and I knew what day we needed to be at our goal destination. I made some tentative plans for in between but we had to be flexible in a million ways. That’s when the adventure happens though so it’s all good. My mom’s dog does very well traveling with them in the car. He doesn’t like being in a hotel room by himself, though. I wish the girls liked traveling. Many hotels don’t allow dogs to be alone in the room anyway (although people with quiet dogs can cheat). It’s no big deal when traveling fall to early spring because it’s usually cool enough to leave them in the car. Places that are cold but get a lot of sun can still cause issues though. In those cases, it’s a lot more challenging to travel with a dog if they can’t sit in the car while you go to a restaurant or non-dog-friendly attraction. We went on a Florida to Michigan driving trip with Sully when he was just about a year old. I wish I had read this then, and planned ahead. A lot of planning ahead comes with practice. Each dog is different and needs different things. It sounds like all you need is more fun road trips! Ha, ha. Ah, yes, I could see that being an issue. I know that can make ME carsick when I’m not driving.